The Emma Bursick Memorial Fund (EBMF) continues to search for information on non-invasive seizure detection and monitoring devices as well as other developing technologies on an ongoing basis as it becomes available. Although these devices have not as yet been proven to prevent SUDEP, we feel strongly that people living with epilepsy or seizure disorders should have information and resources at their disposal to support living well with seizures. The EBMF is proud to present a grant to the Epilepsy Foundation Western/Central PA which will provide financial support to qualified applicants for purchase of in home monitoring devices. The grant program is entitled “Emma’s Gift”. We encourage and strongly recommend applicant communication with manufacturers of these devices, as well as consultation with doctors about the effectiveness of such devices for your specific needs. Please review the product options below. You can access the monitor grant application HERE. 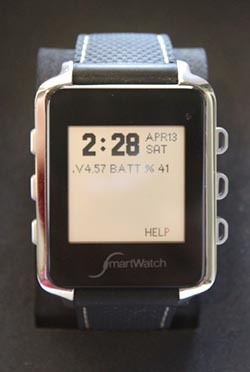 The SmartWatch is a movement detection and alerting monitor. The Watch is looking for 7 seconds of repetitive, shaking motion. Once the motion is detected an abnormal motion event will be triggered. The SmartWatch will alert family members within seconds with a text message and phone call! These alerts can go to any phone, anywhere. On Gold models, the GPS location is included in the alert message. The SmartWatch also has a help button. Press this button to summon help for any reason. All event data is stored on the phone and a secure cloud server. Access this data to track your events and share with your physician. Better data = Better care. 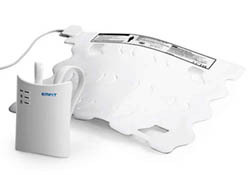 The Emfit Movement Monitor is an intelligent bed monitor that continuously monitors movements and alerts upon the onset of repetitive muscle spasms. The Emfit Movement Monitor consists of two main components: a flexible and durable bed sensor placed under the mattress and a bed-side monitor with sophisticated embedded software. The Movement Monitor detects when a person has continuous faster movements over a pre-set amount of time and then triggers a notification. The system also notices light movements, thus making it equally suitable for small children. For more information on Emfit, visit www.emfitcorp.com. SAMi is a sleep activity monitor for caregivers and individuals who need to watch for abnormal movements at night. During sleep, audio-video information from a remote infrared video camera is sent to an app running on an iOS device such as an iPhone or iPod Touch. The SAMi app records and analyzes the video for unusual activity. When an unusual event is detected, an alarm is sounded, followed by live sound and video from the SAMi network camera. A parent/caregiver can then take any necessary action. * The EBMF is not a manufacturer, distributor, broker, or seller of any of the products listed on our website. We do not warrant any of these devices, and do not accept responsibility for any of the consequences of active use of them. The EBMF does not endorse any particular seizure monitoring device; selection of a listed device is the sole discretion of the user.